This is the second article in a ten-part retrospective of the Harry Potter soundtracks. You may wish to refer to the previous entry in the series for more information. According to a recent special on the Biography channel, John Williams was asked by the studio to write a music cue for the upcoming Harry Potter film. He wrote the iconic composition now called “Hedwig’s Theme”, which as I noted in my previous article contains pretty much all the music for the first film, at least in part. 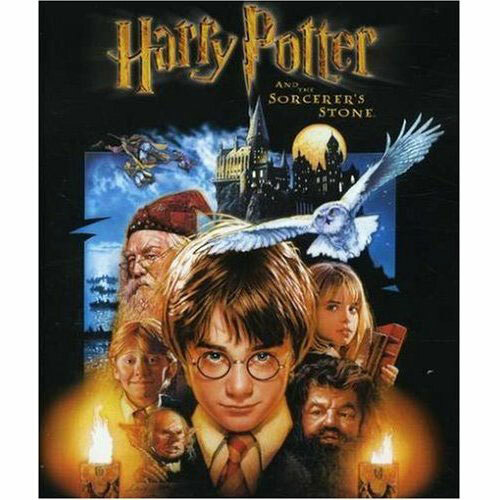 And then, when Warner Brothers hired the man who wrote the themes for Star Wars, Superman, and many others to score the first of what would become eight blockbuster films about a boy wizard, he expanded upon that theme to give us the soundtrack to Harry Potter and the Sorcerer’s Stone. From the opening notes in “The Arrival of Baby Harry” to the — for lack of a better term — megamix track of “Harry’s Wondrous World”, Williams takes the listener on a musical journey full of light, sweeping wind, string, and horn instruments, with a liberal dose of bells that simultaneously engender wonder and apprehension: what are these people going to do next, and how is it going to make me go “that’s amazing!”? After “Arrival”, Williams sets the tone for the rest of the film with “Visit to the Zoo and Letters from Hogwarts”, which contains a musical cue I like to call “wizards doing wizard stuff” — a sort of generalized positive theme. More even than “Arrival” or “Hedwig’s Theme”, I think the music in “Visit” really exemplifies what the film is about — Harry knowing he can do this magical stuff and then learning the full truth of it. “Visit to the Zoo and Letters from Hogwarts” — the scene with letters pouring into the Dursleys’ house. “Diagon Alley and the Gringott’s Vault” — the jaunty tunes of happy times, also repeated during the Christmas scenes, and then more bells and horns played triumphantly. This track also contains the “epic discovery theme” which is played again in various forms when we find out that it’s not really Snape who’s the bad guy*. “Mr Longbottom Flies” — this is the scene where we’re truly introduced to just how much a spoiled brat Draco Malfoy is, and it would have been a good place to put a musical cue for him, but instead we are treated to the “flight theme”, which is writ large in the Quidditch match later. There’s also a very heavy-handed “you’re in trouble” cue which is used when McGonagall tells Harry to come along with him. “The Quidditch Match” — every single positive theme is used in this track. Since Quidditch was one of the big things people were dying to see in theaters, it only makes sense that Williams went all out. Plus, in scenes where it’s hard to have a ton of dialogue — in Quidditch, the players are too far apart to really communicate effectively — the music has to play an additional role. That is, it is the dialogue. Still, that’s no excuse for cramming literally every triumphant cue into the ending of the track. “In the Devil’s Snare and Flying Keys” — at this point we knew none of the heroes were really going to die, and Williams played that up by using bells, harps, and those hanging xylophone-y things that sound like pleasantly-jingling keys to communicate that. “The Chess Game” — of course, we jump straight into the chess game, which finally gave Ron a chance to shine, and although it used lower octaves and lower-registered instruments, it still felt more silly than serious. There were the requisite horns, but the percussion threw it off for me. Honestly, the percussion made me think of what Ken Thorne used in Superman 2, and at the end of it, when Ron sacrifices his piece, that felt very Superman-y to me. But again, with Superman being a larger-than-life hero, you expect this kind of music; Harry Potter being such a larger-than-life film, I guess it’s no surprise. “The Face of Voldemort” — for a “final battle” track, this had the right amount of gravitas, but since the battle in the film was more about “stuff happens to Harry” than “Harry defeats Quirrelldemort”, there really wasn’t a whole lot for Williams to work with. There’s one track that really made no sense to me, which was “Christmas at Hogwarts”. The latter half, when Harry realizes that he has presents, is very strong (and again full of bells), but in the beginning there’s a chorus softly singing Christmas songs, and it sounds more creepy than anything else. We hear a lot more music-for-specific-characters in the later films, likely because we’ve already learned about the world and don’t have to deal with all the sonic exposition. We know how we’re supposed to feel at certain times. Because there’s so much to explore in the first film, and so much that viewers have to be introduced to, it makes sense that Williams focused on trying to create the right kind of ambiance — that is, making sure you know that Draco’s supposed to be evil, that the Great Hall banquet is supposed to be happy, and that Quidditch is fun and exciting. The few times Harry is in true danger, at least early on (like when he first meets Fluffy), deep brass and low strings are used, with very few bells. In fact, a whole lot of bells went into the soundtrack of this film. Listening to it, it feels more… I guess juvenile would be the right word. Again, that makes sense — the music is really telling you what’s going on in the way that an eleven-year-old can understand because the film is told mostly from the point of view of an eleven-year-old. There’s a lot of bells and harps, a lot of heavy strings that drag your emotions in the right direction, and remarkably few brass hits, the kind you might hear in one of the later films. Basically, the more bells you hear, the “better” the film is going for our heroes. Overall, I think that the Harry Potter and the Sorcerer’s Stone soundtrack will forever live on in our hearts because it gave us “Hedwig’s Theme”. However, in terms of soundtracks, I’d say it’s only average. There was a lot of what I feel is “filler music” — “Hogwarts Forever! and the Moving Stairs”, for example — that, while useful in the film, was hard to reconcile when listening to it as its own piece of art. I’d rank it in the middle of the pack** — better than the sixth, not as good as the fourth, and probably the second- or third-best of the three Williams did. * I feel comfortable saying this and not giving a spoiler alert. Seriously, if you don’t know by now that Snape’s not the bad guy, you should stop reading these articles and go read the books. ** I tried to put them in order, best to worst, but I really had a lot of trouble doing that. Each of them has merits and downfalls, and anyway, what I say is best may not be what you say is best. So I skipped that for now, but I might come back to it after all’s said and done.